Airbrush t-shirts, hats, boxer shorts & products for parties & events. 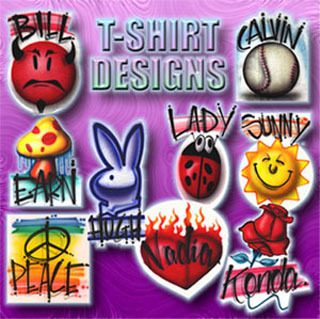 Outrageous art designs are airbrushed onto hats, shirts, boxer shorts, scrubs, license plates, beach towels, mouse pads, visors, tank tops or pillowcases. The artist brings an assistant to organize the items and take orders. Guests choose the design from several samples and also get their name airbrushed above the artwork. The minimum booking is 3 hours, during which time the artist can airbrush 45 items (15 per hour). Option: add a second artist! This gives you an additional 15 pieces per hour for larger parties. There is a 3 hour minimum for the second artist. Product prices are not included in the artist's fee. Call our office for a complete listing of products and prices. Requirements: two 8' banquet tables and one chair. The artist should not be placed in a cold, damp or windy area. The smell of the airbrushing is not noticeable and will not bother guests. You may provide your own products but usually it's recommended that we bring the items.